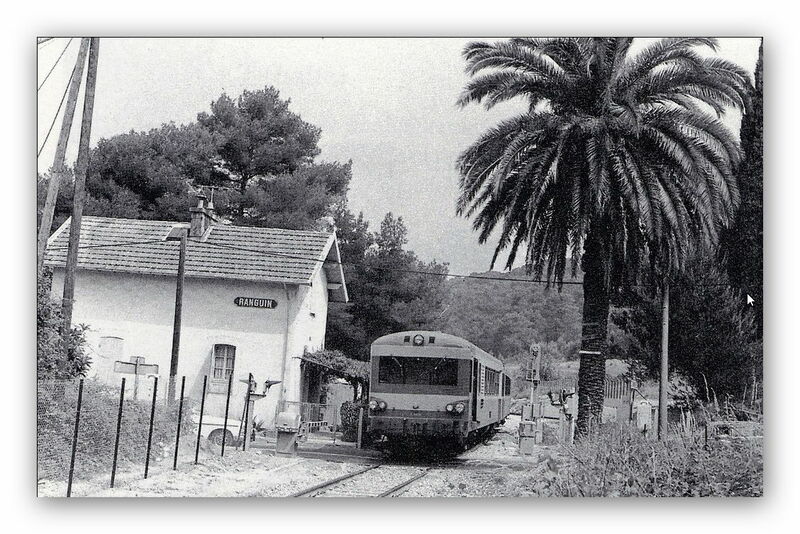 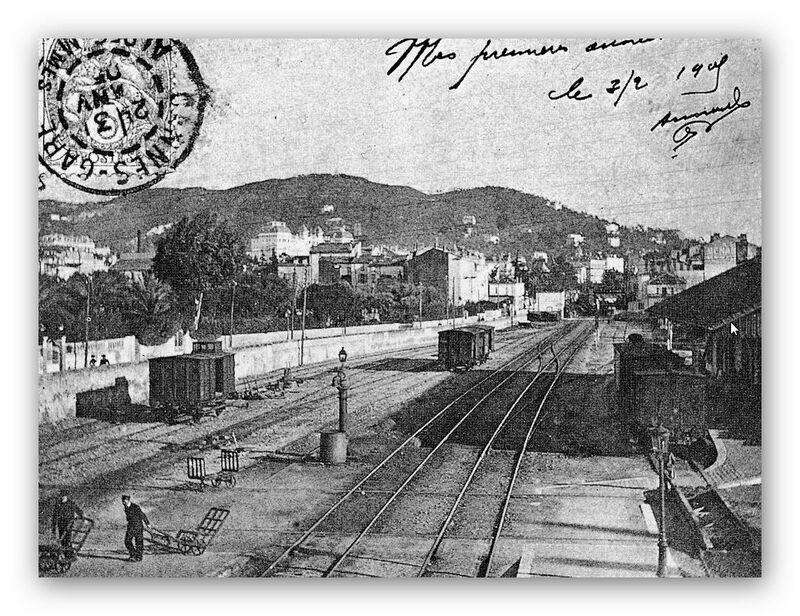 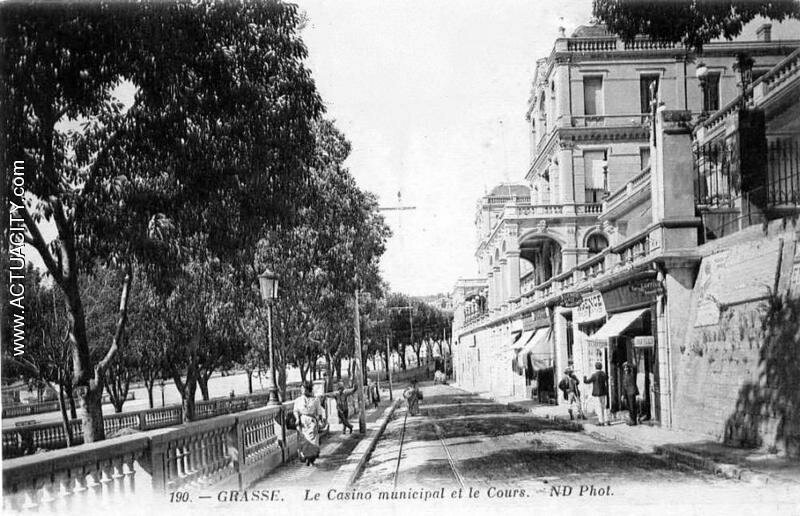 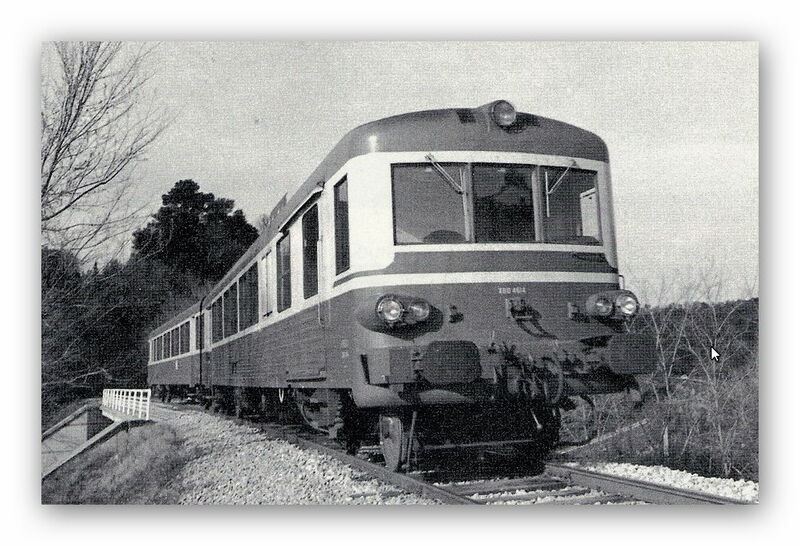 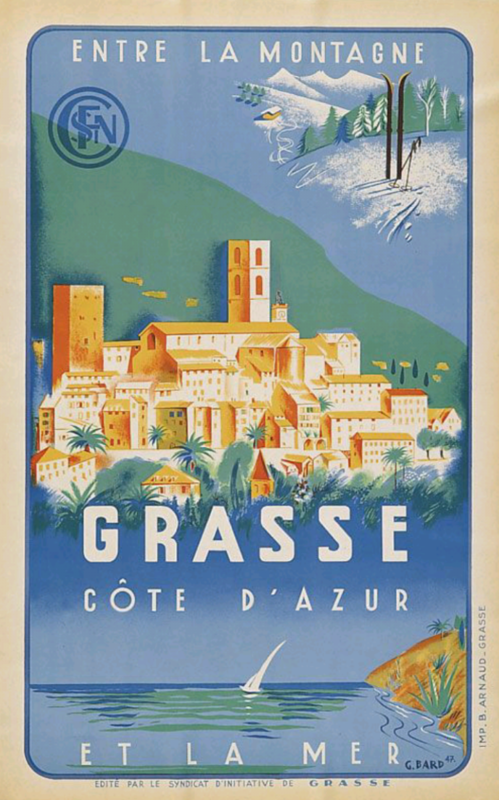 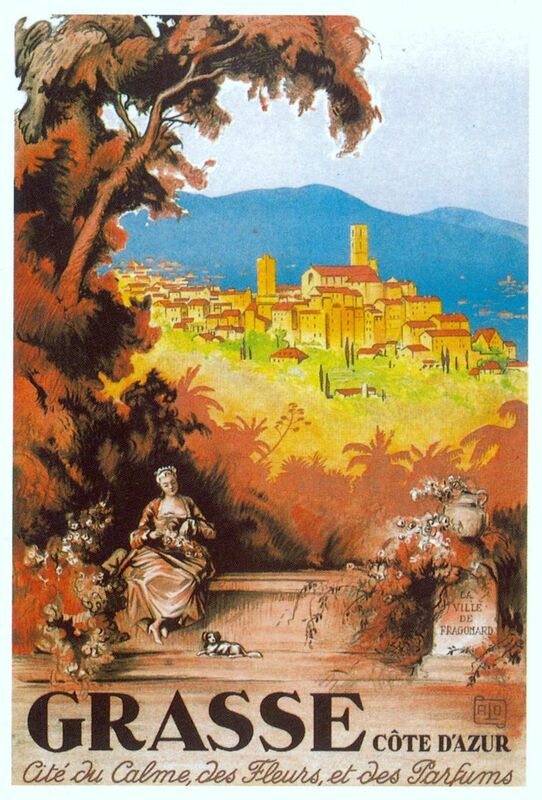 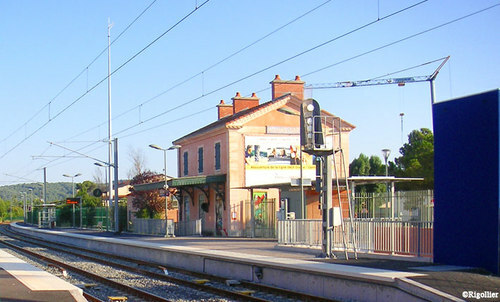 The line between Grasse and Cannes was opened in 1871 by the Chemins de fer de Paris à Lyon et à la Méditerranée (PLM). 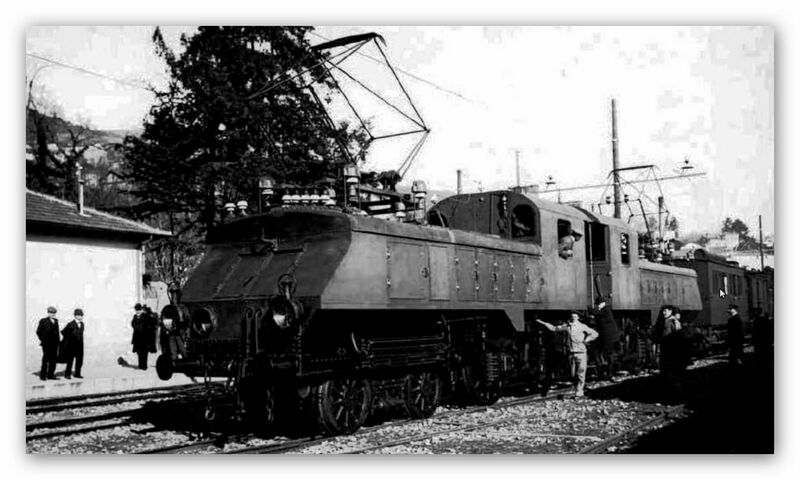 For a time, from 1910 to 1914 it served as an experimental route for 12kV/25Hz single-phase electrification. 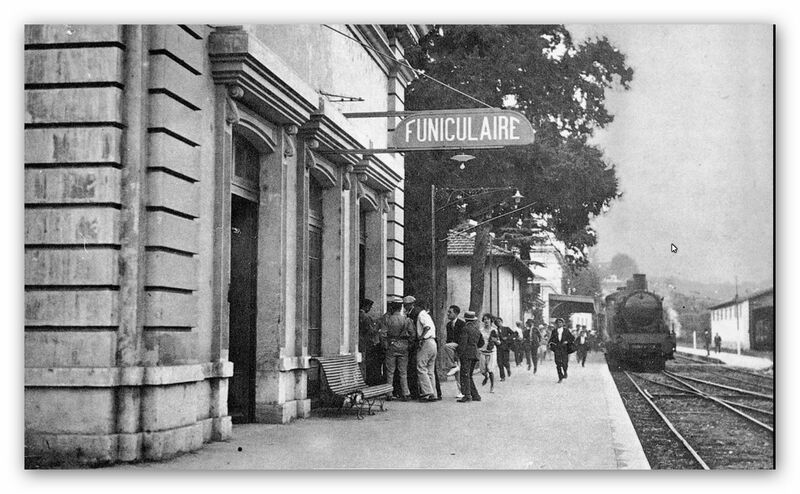 The line remained open to passangers until 1938. 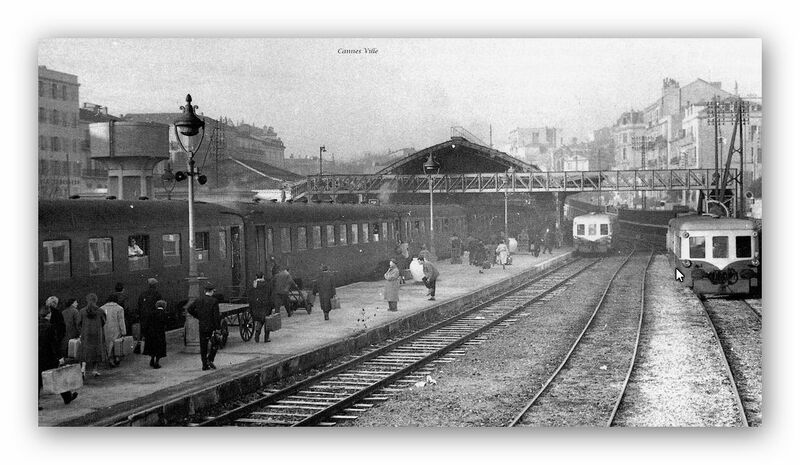 It was reopened for military wartime traffic in the early 1940s and after the war closed once again. 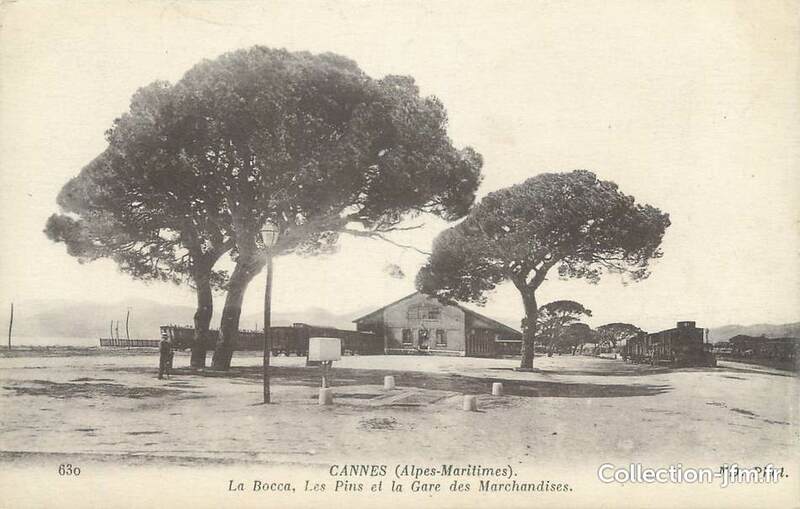 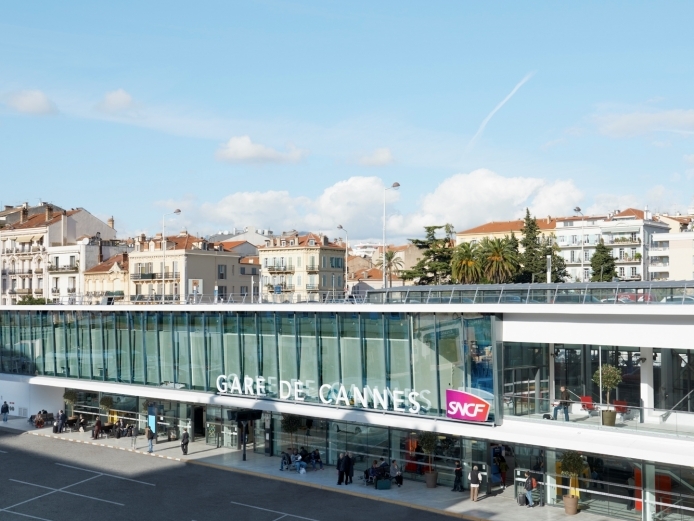 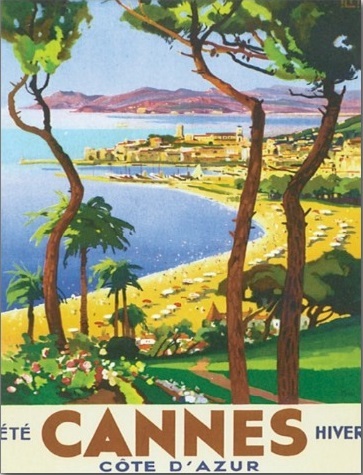 It was partially re-opened in 1978, between Cannes-la-Bocca and Ranguin. 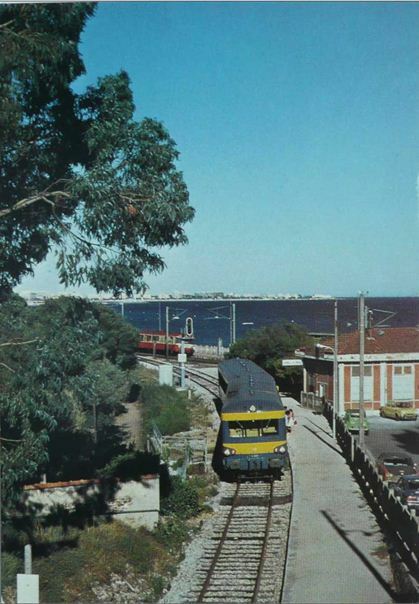 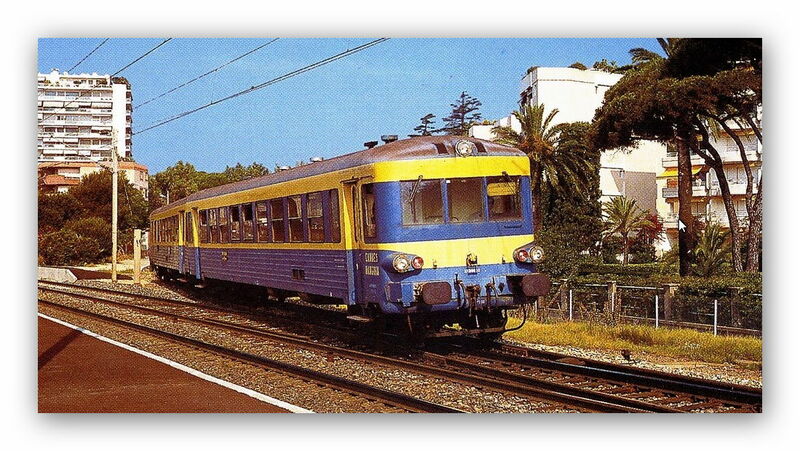 The passenger service lasted until 1995. 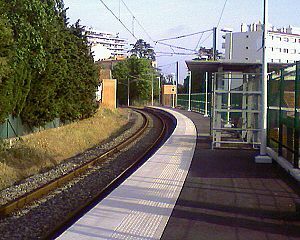 Ten years later, in 2005, the line was reopened to traffic, this time along its full length and using a 25kV/50Hz power supply. 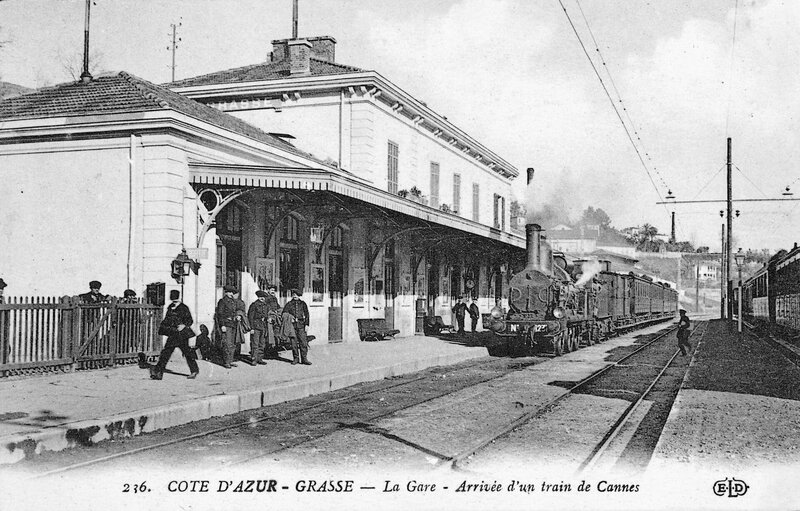 Some goods traffic uses the line between Cannes and Ranguin. 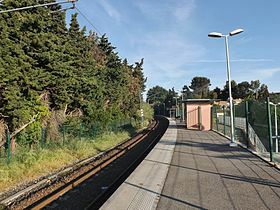 More recently the service has been halted for a year to allow line improvements. 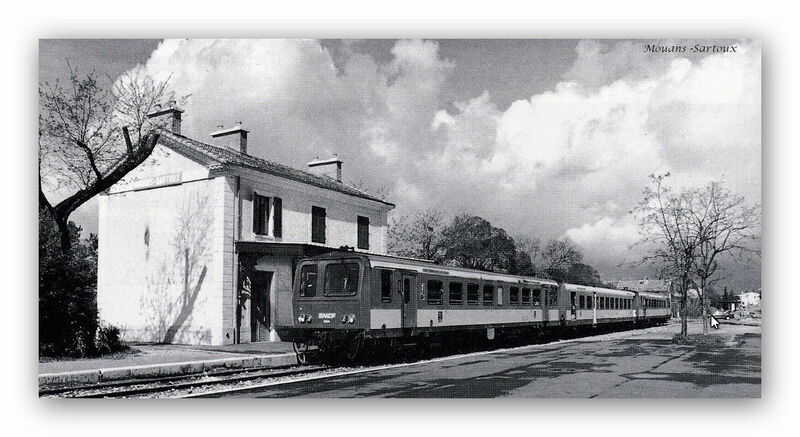 The line will re-open with double the capacity on 10th December 2017. 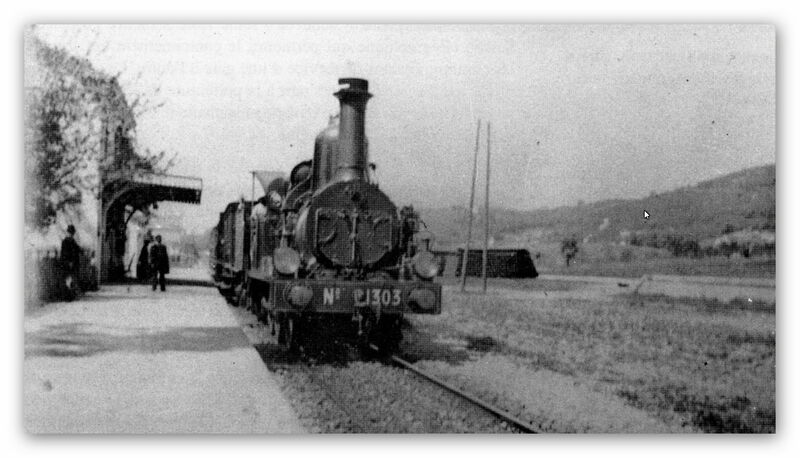 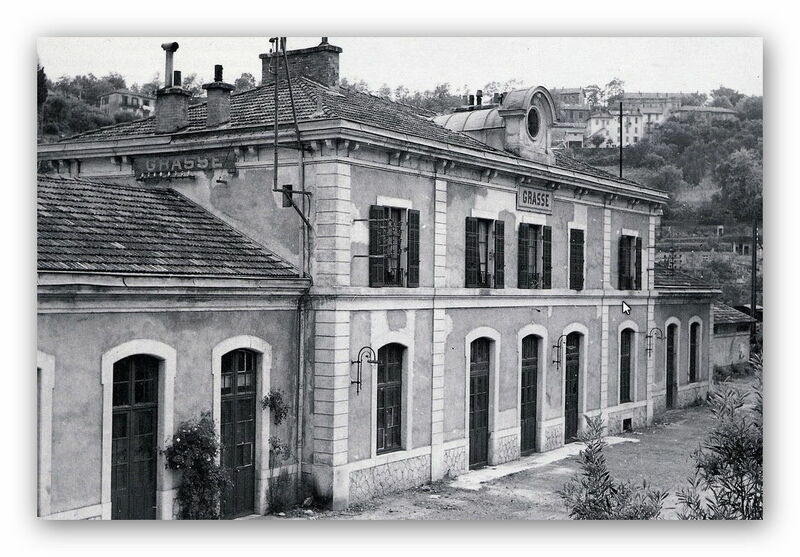 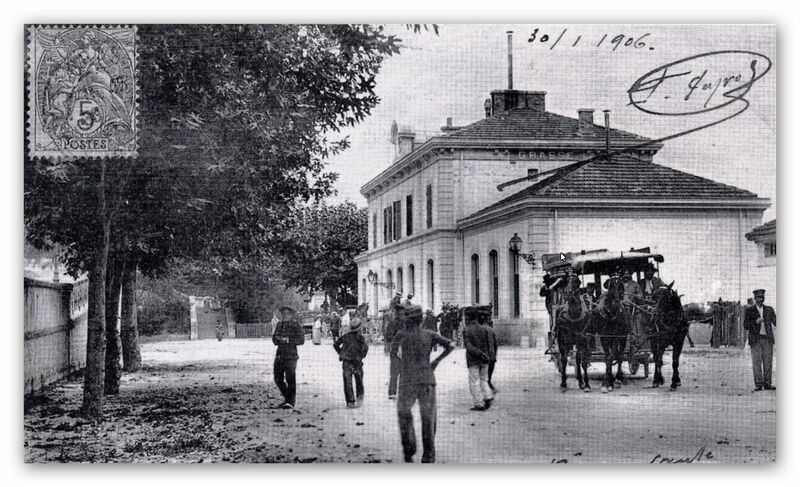 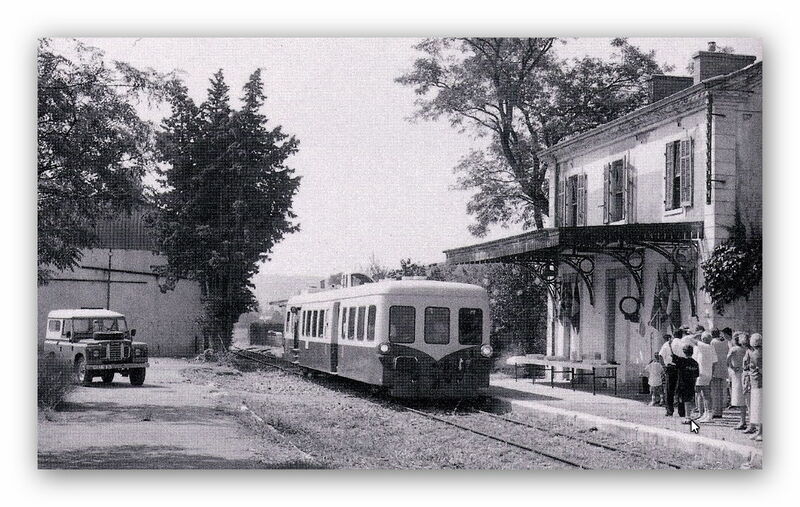 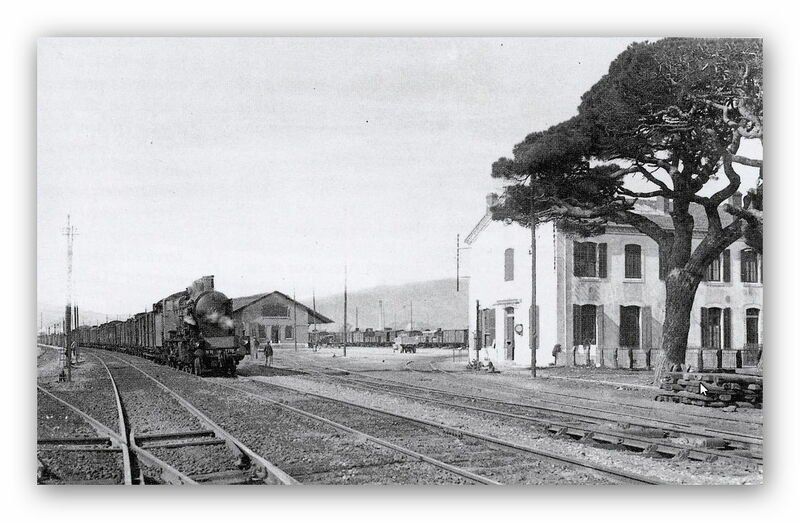 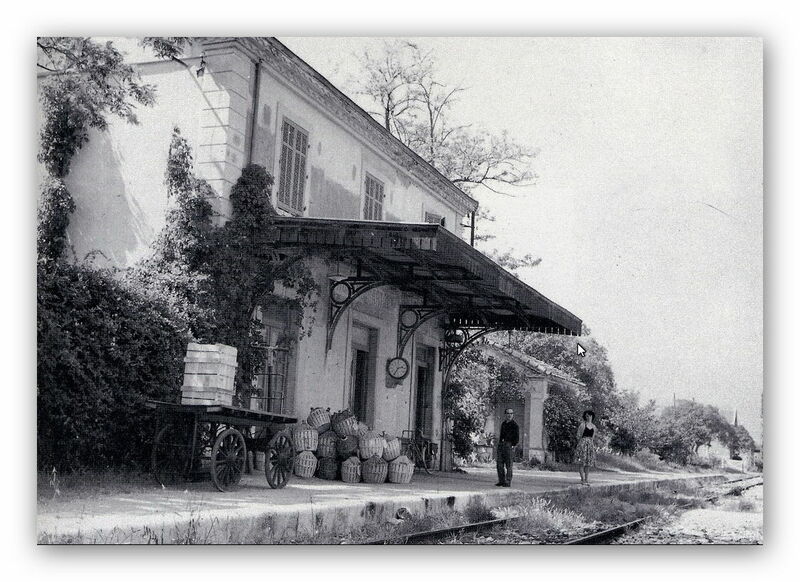 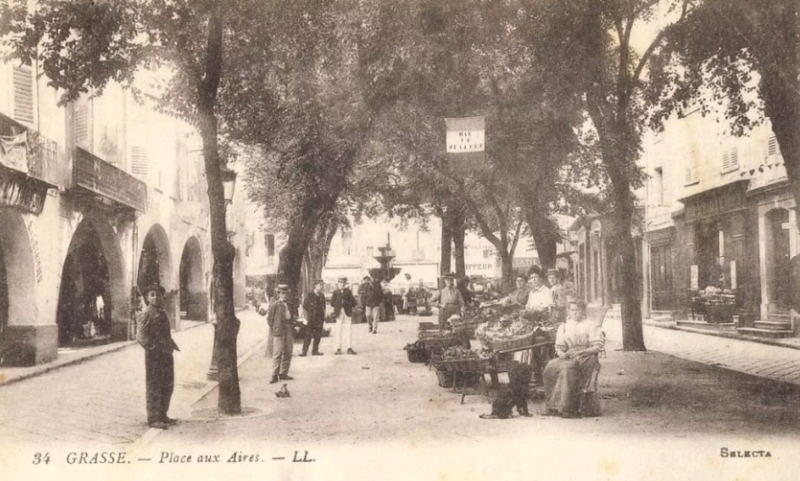 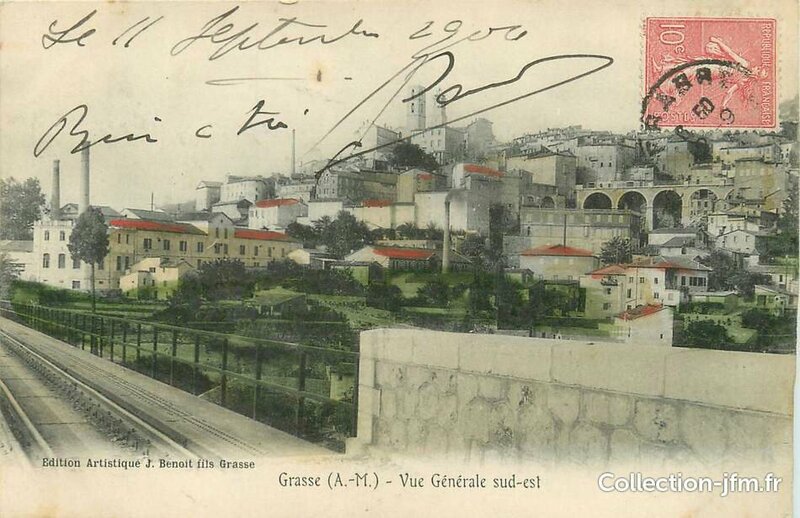 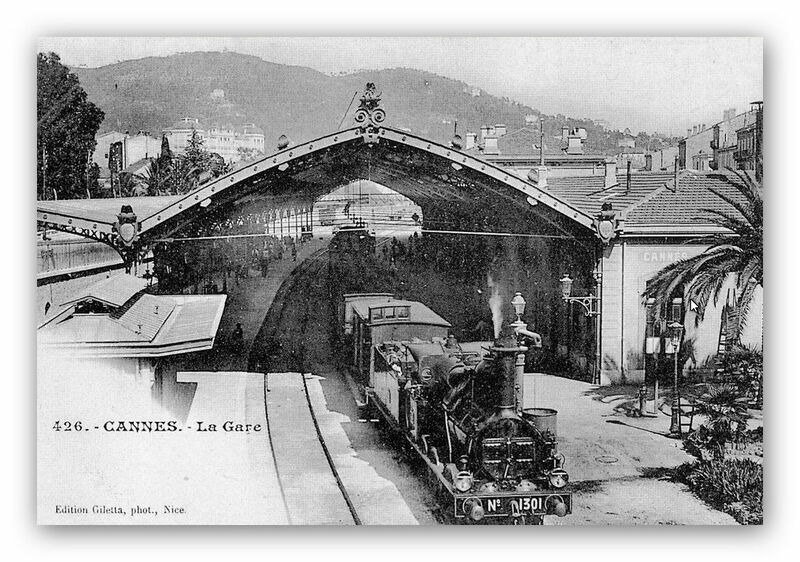 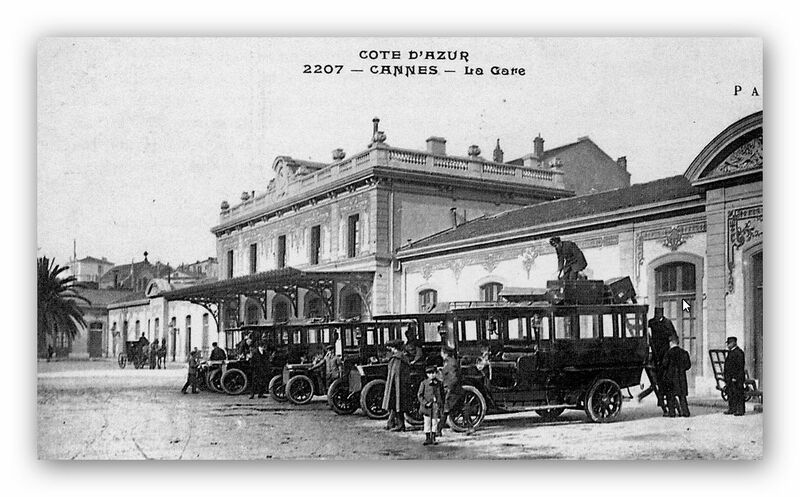 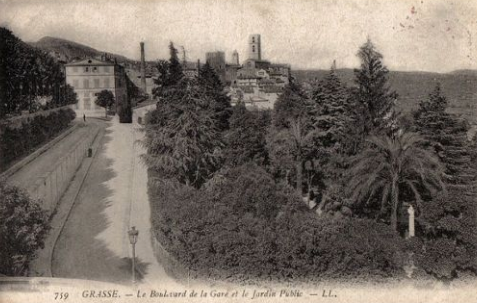 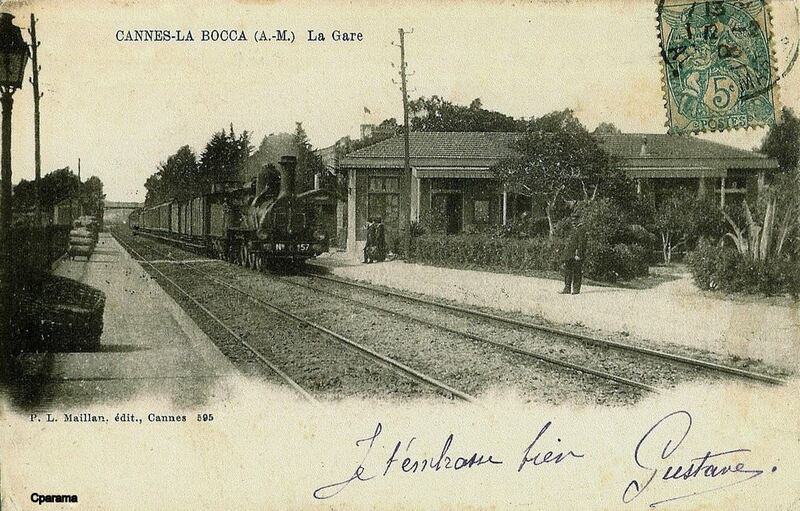 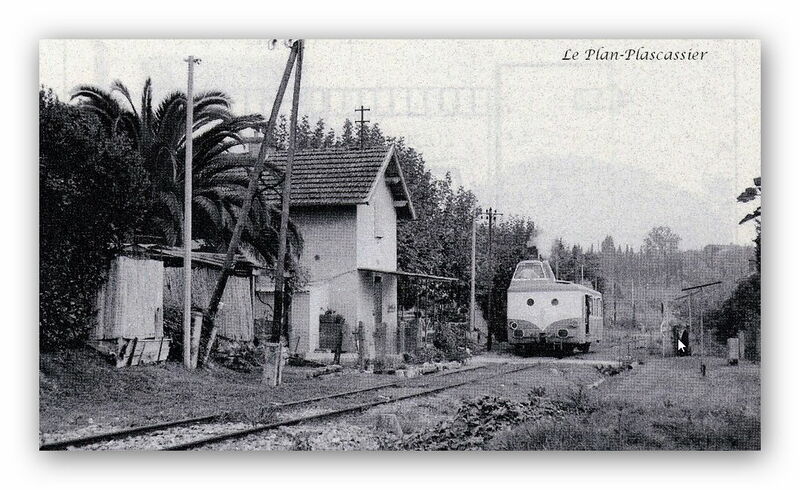 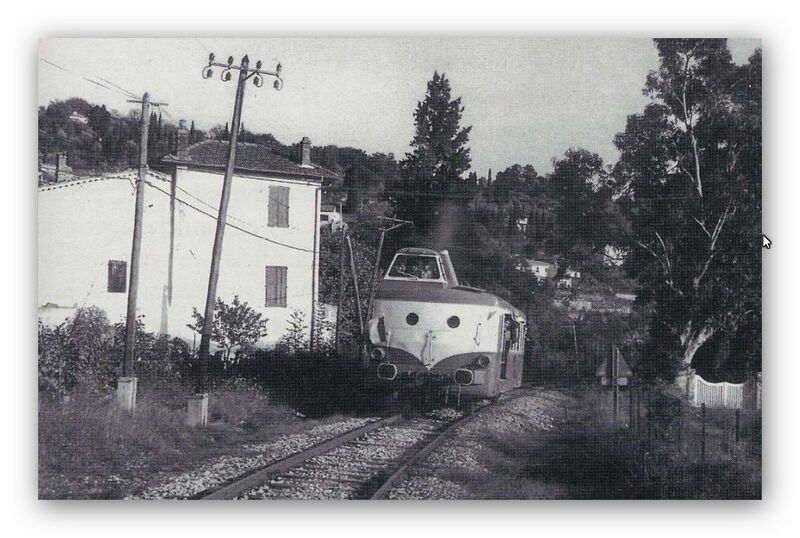 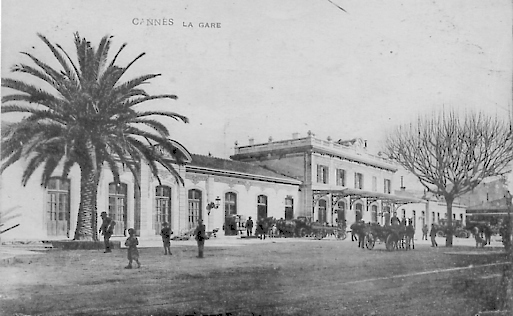 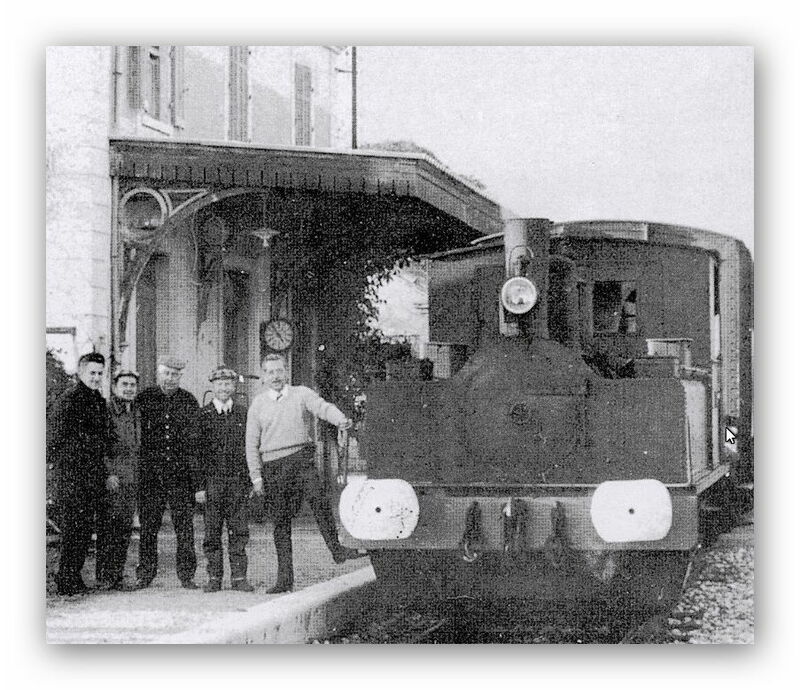 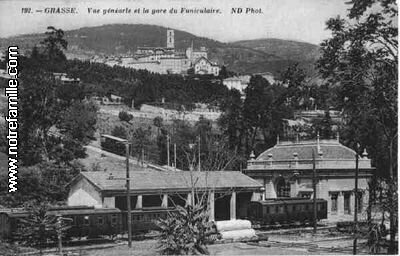 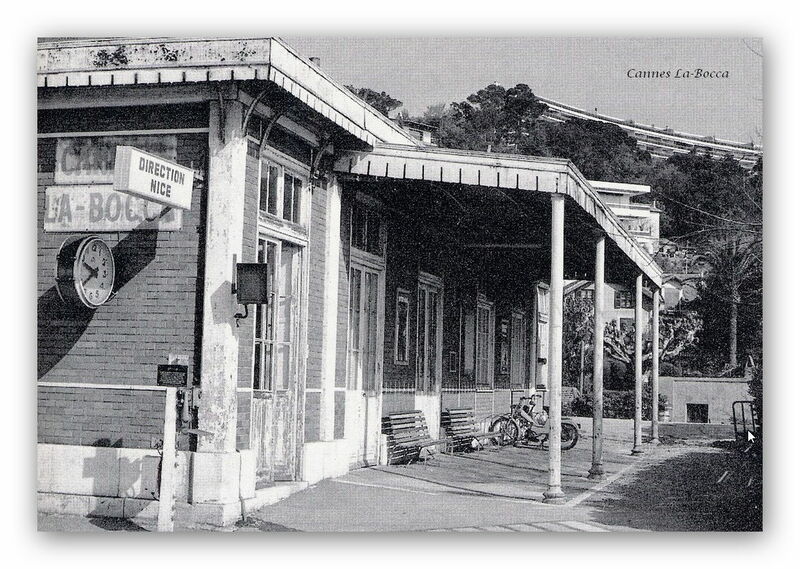 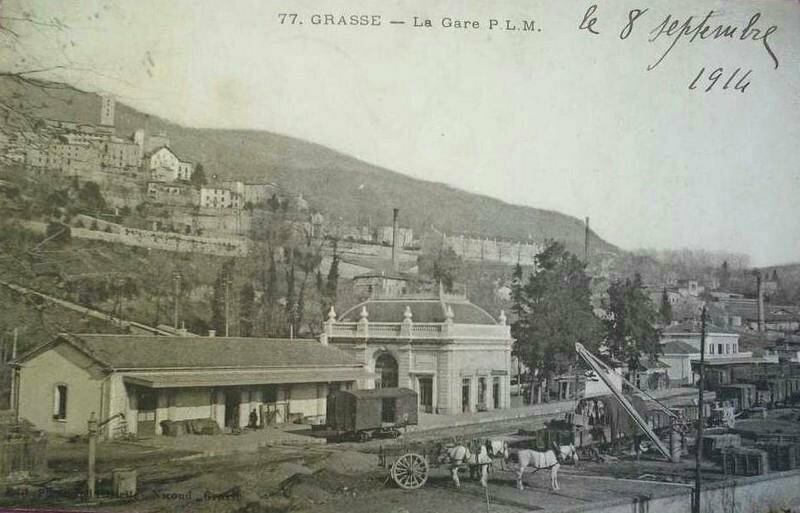 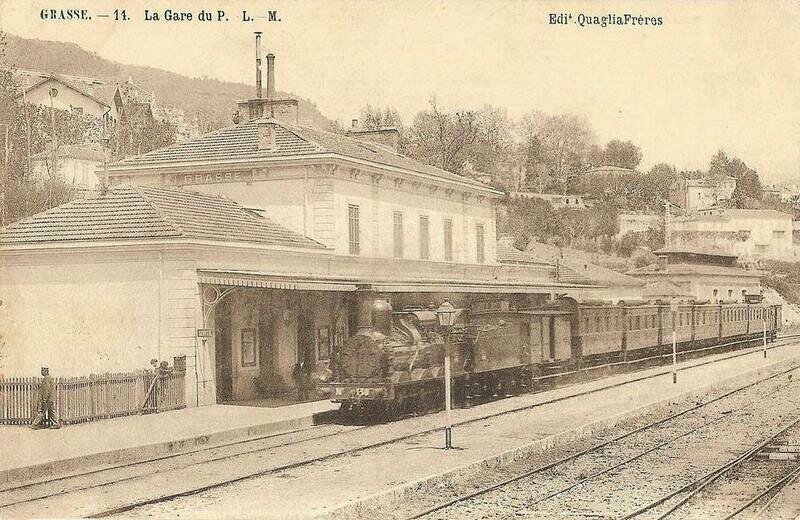 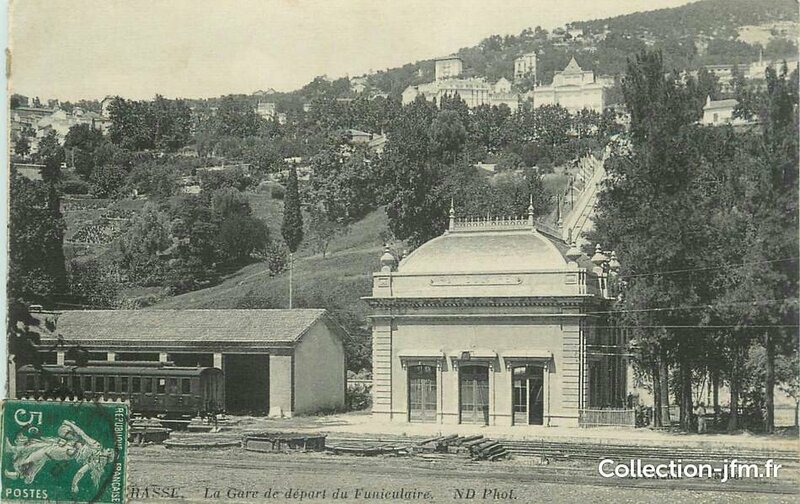 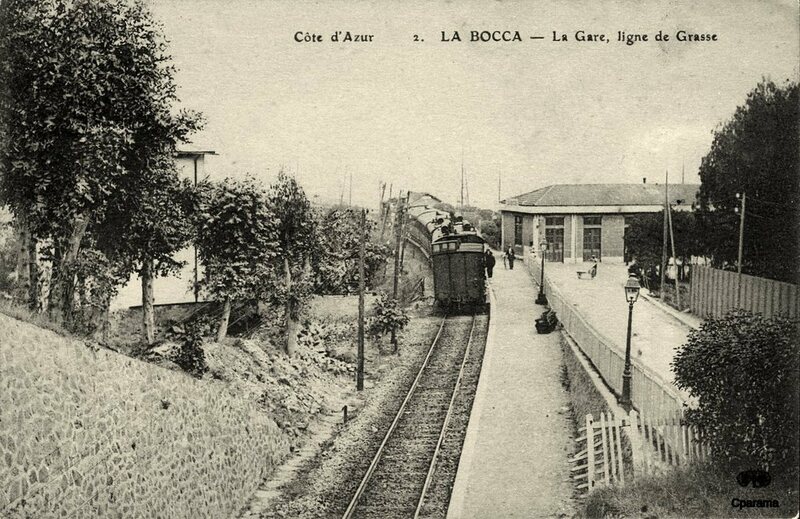 The first photo below shows Grasse PLM station just before the First World War. 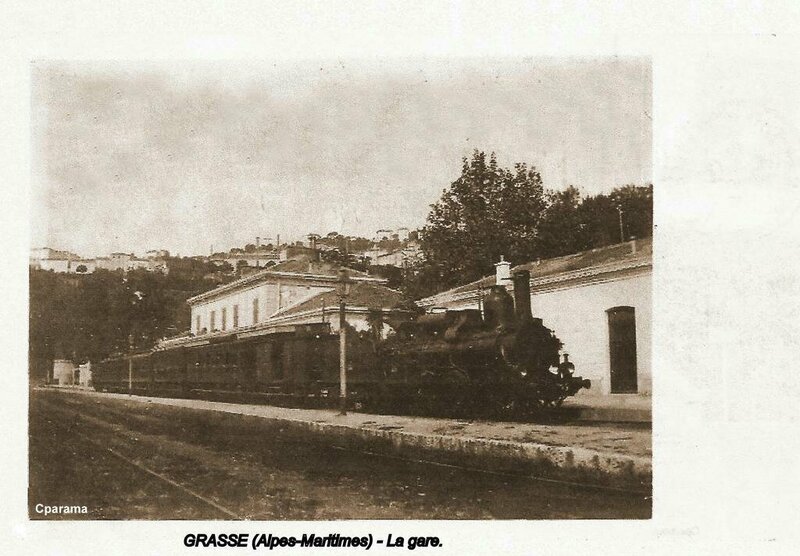 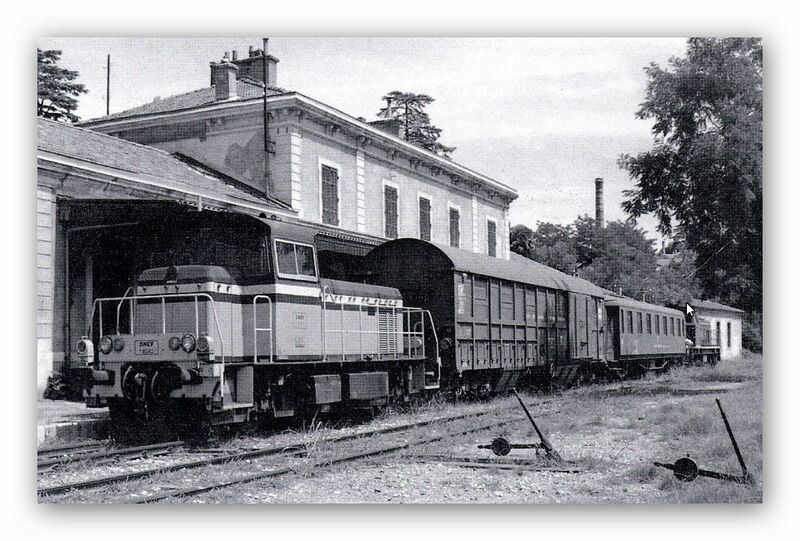 The locomotive in the picture is N ° 1231 built in 1856 by the workshops of the PLM in Nîmes and so already more than 50 years old! 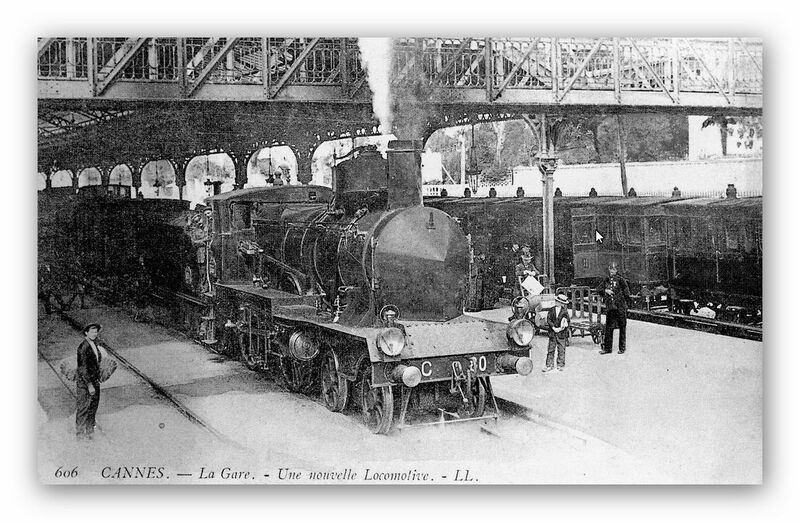 The pictures here give idea of the station and its environment. 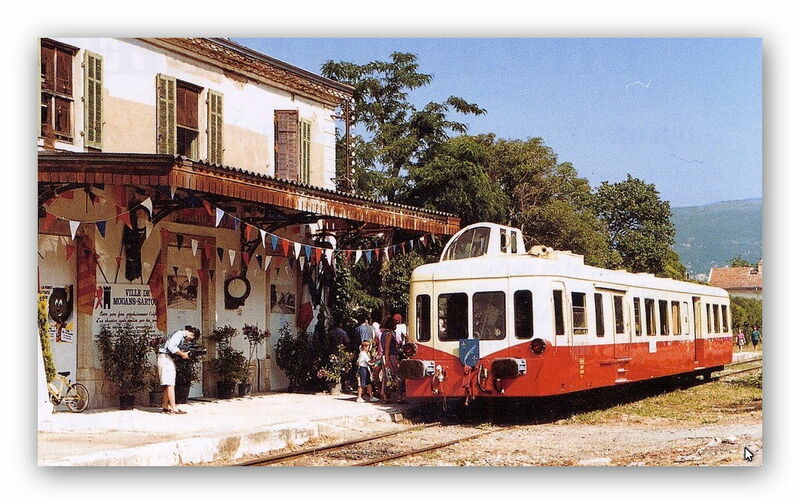 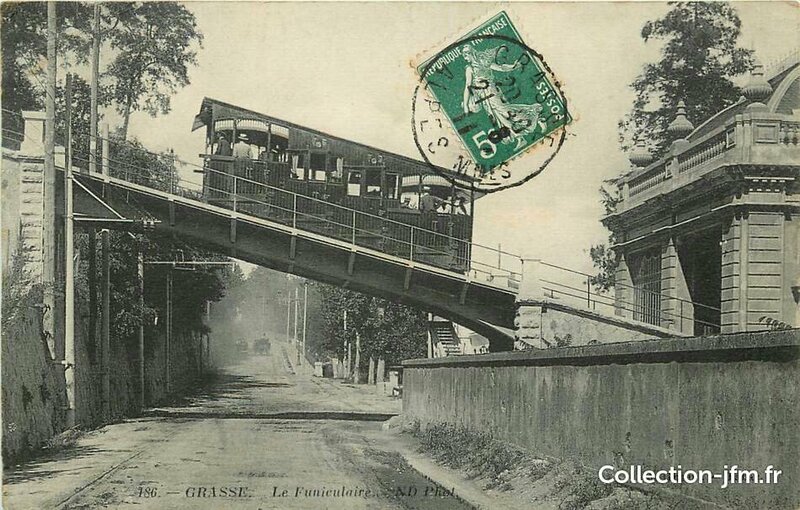 It was served by a funicular and by a tramway as well as normal road vehicles. 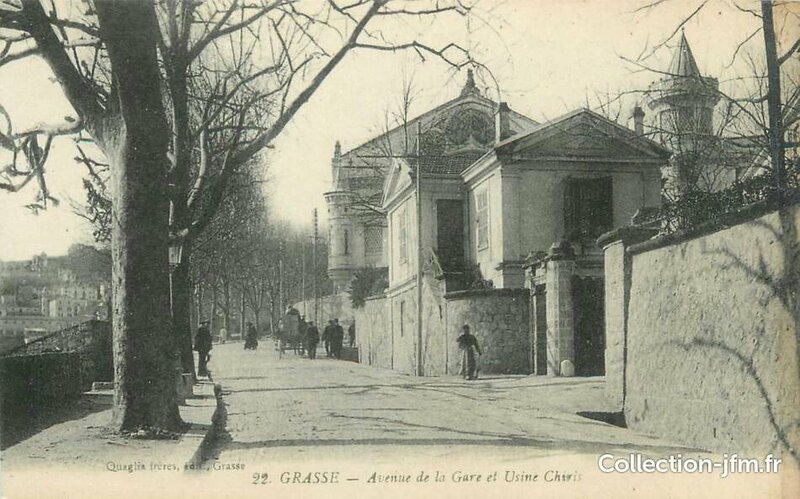 It sat about 110 metres below the centre of Grasses and its Cathedral. 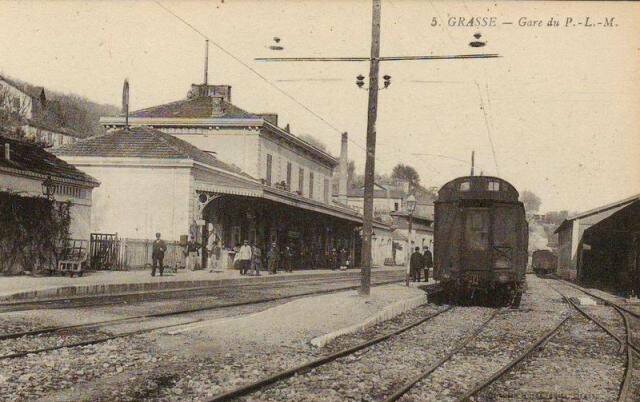 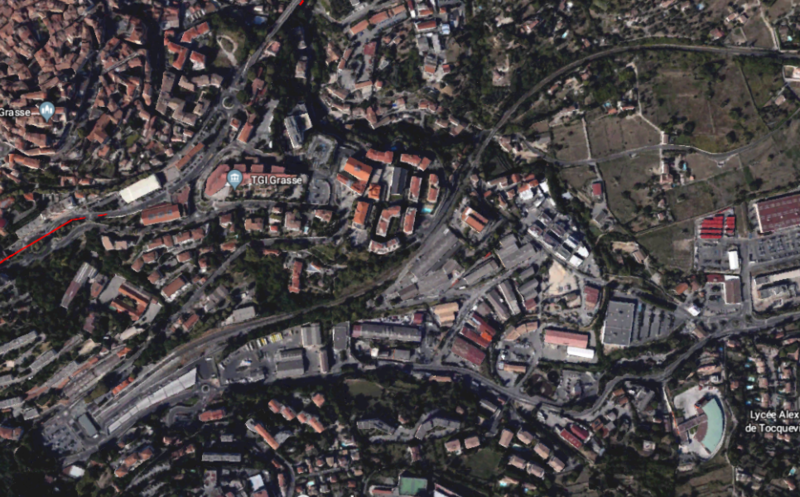 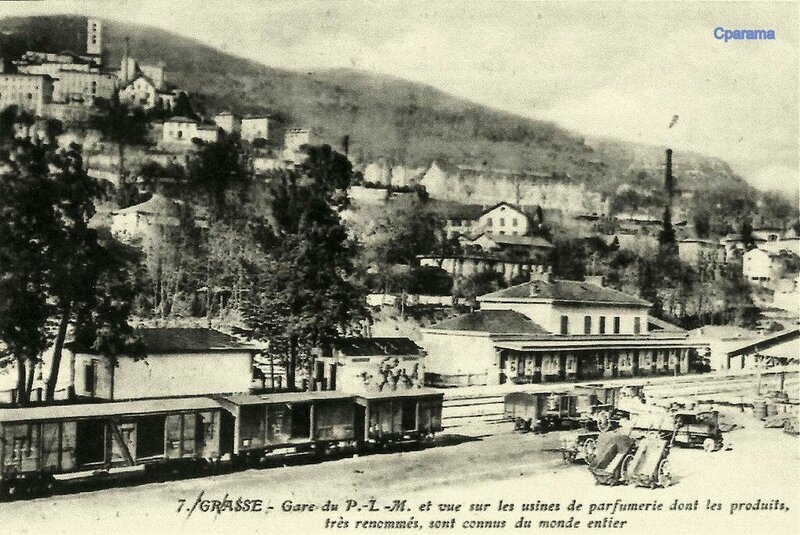 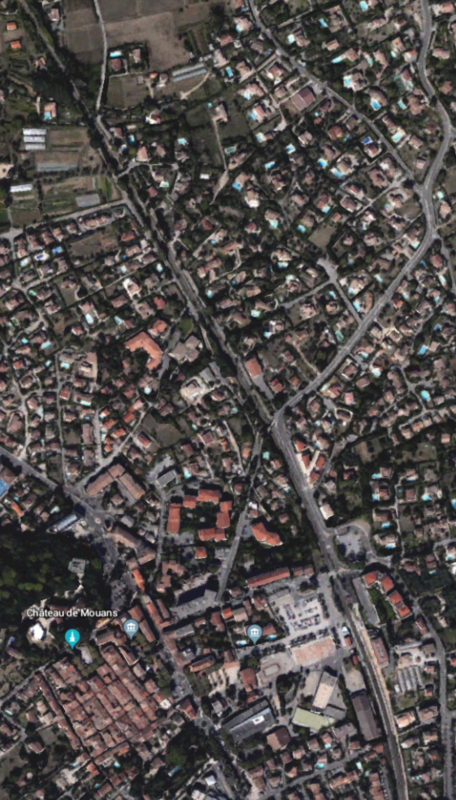 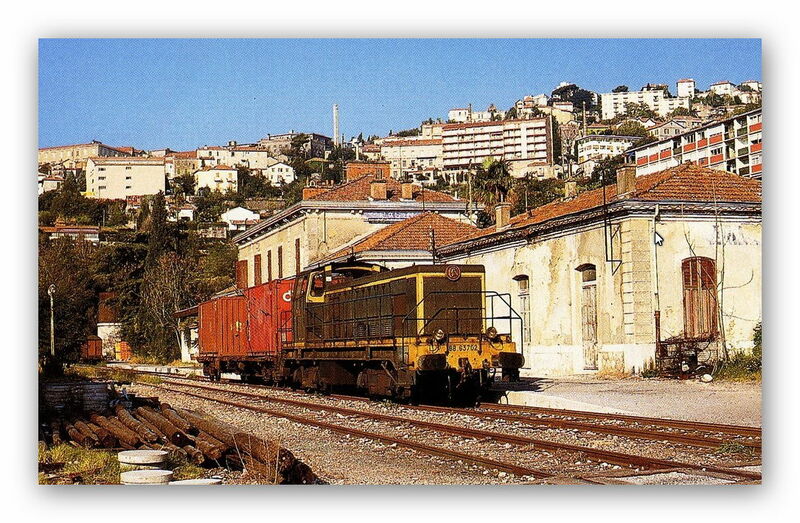 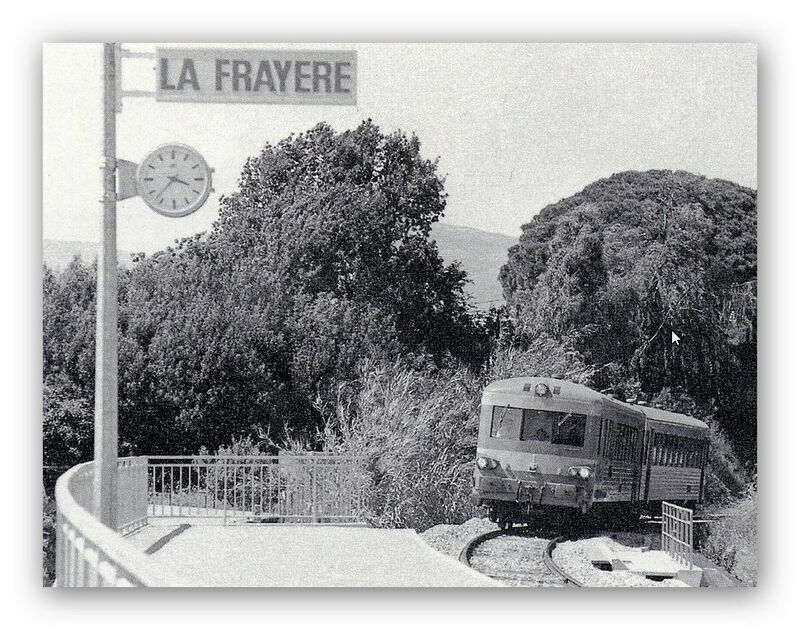 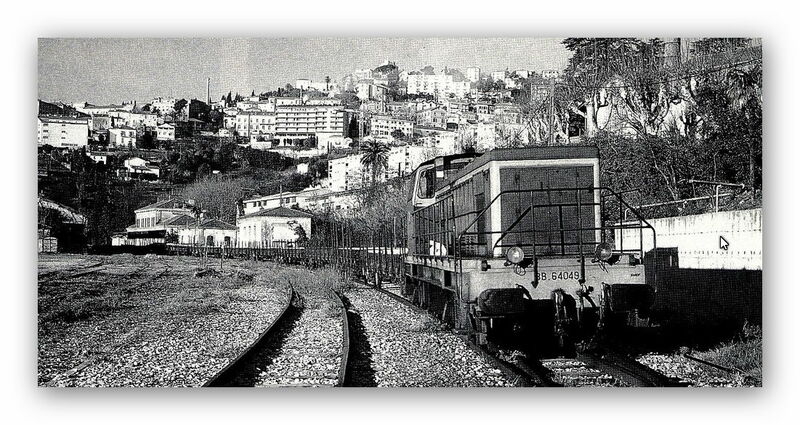 The railway left Grasse station in an Easterly direction and ran parallel to the Chemin de Fer du Sud a little lower down the profile of the hillside. 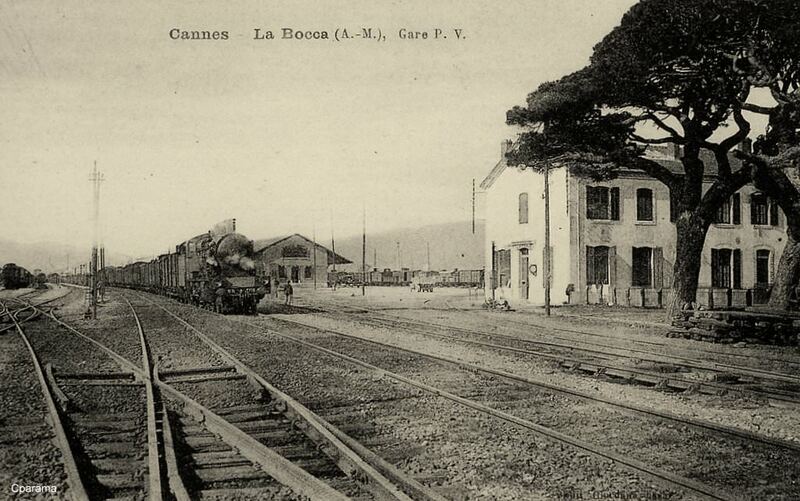 When the Chemin de Fer du Sud turned northward, the Cannes line continued in an Easterly direction for a time. 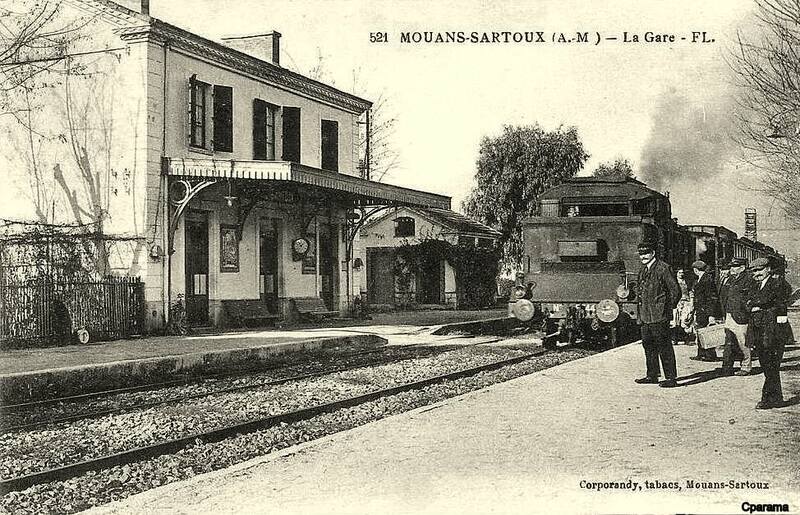 It then turned south towards Mouans-Sartoux. 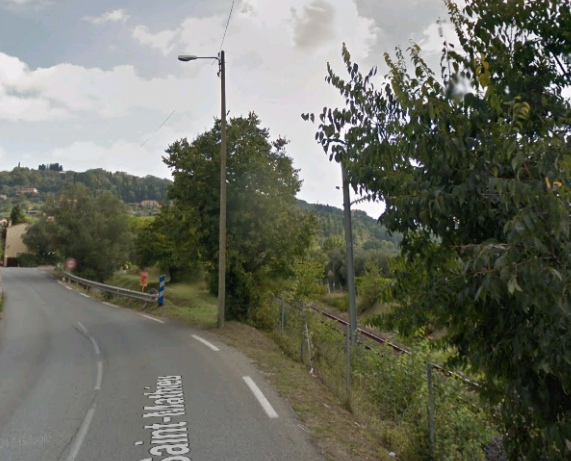 The present track can be seen from the Route de Saint-Mathieu as below. 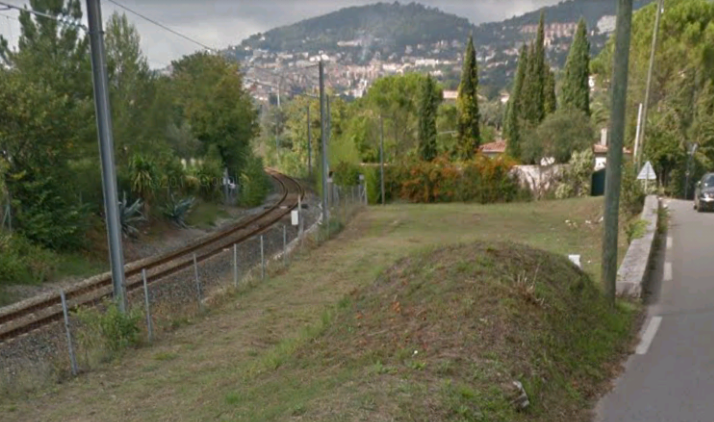 The first image looks back along the line towards Grasse, the second towards Mouans-Sartoux from the same point. 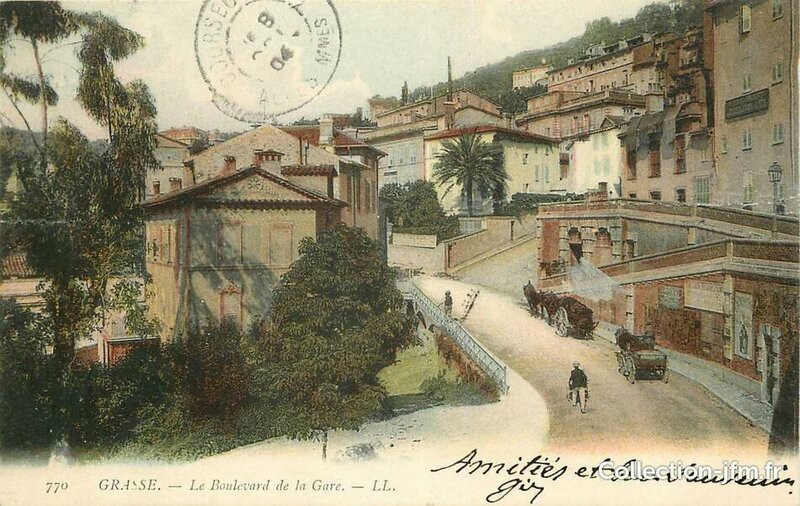 The route travels at relatively light grades down the towards Cannes. 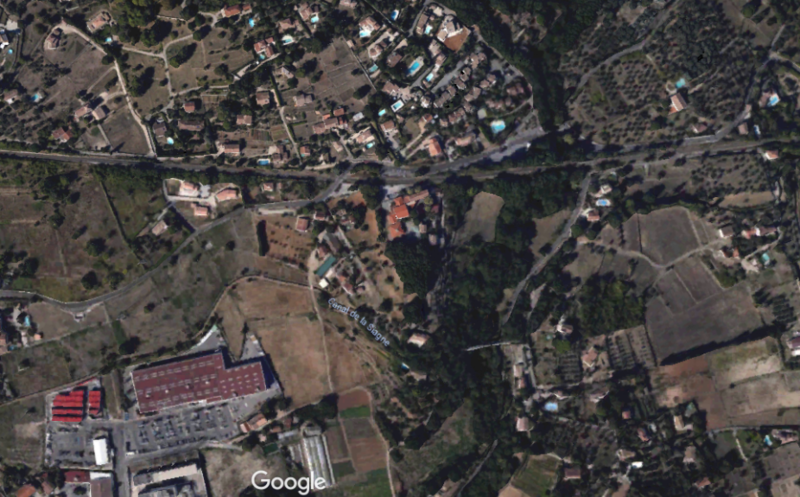 On the plan view from Google Earth, the point at which the two pictures are taken is in the North West corner. 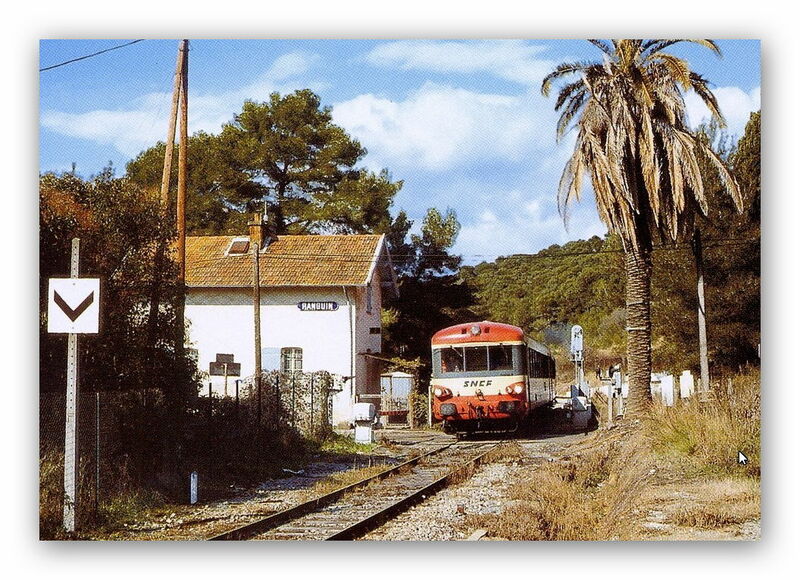 The line can be seen diverting southwards and following the Canal de la Siagne. 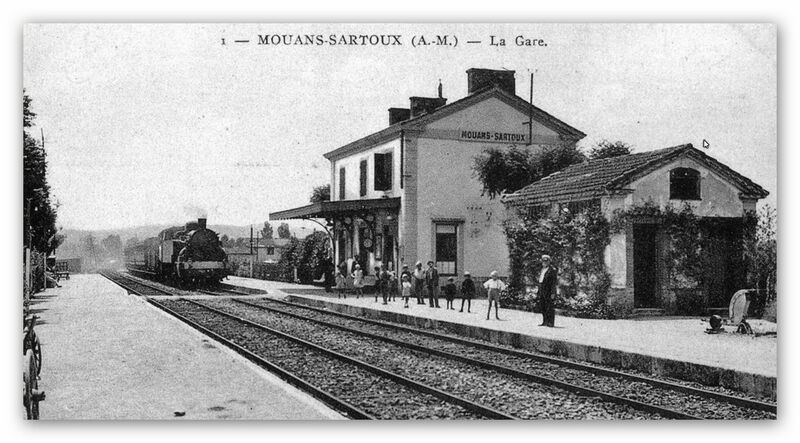 After a while the line passed the Chateau de Mouans and arrived at the station of Mouans-Sartoux. 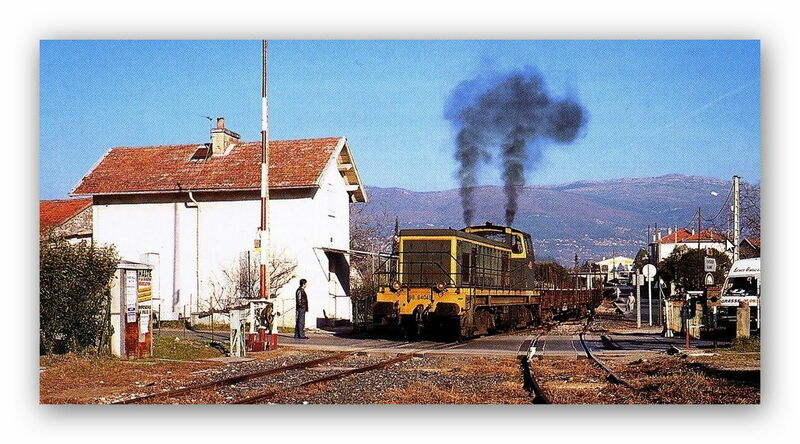 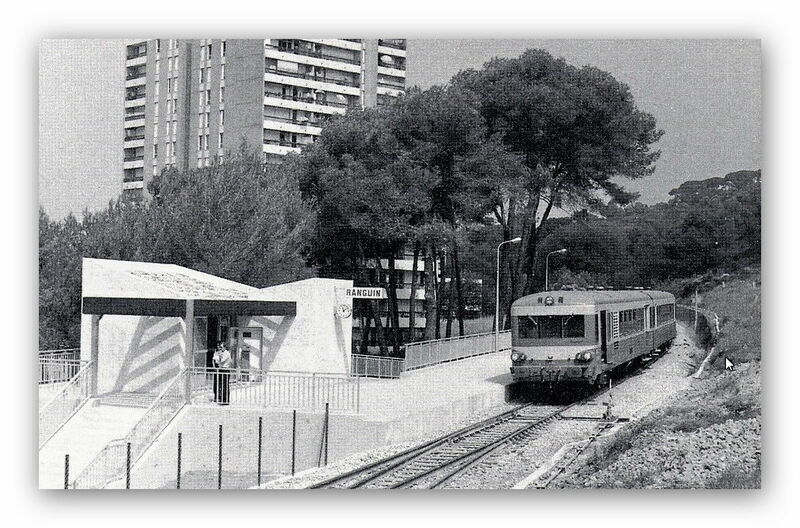 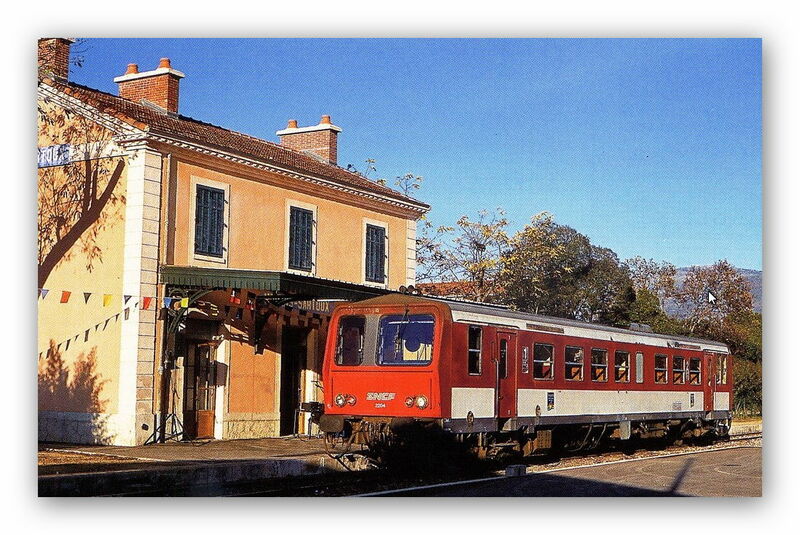 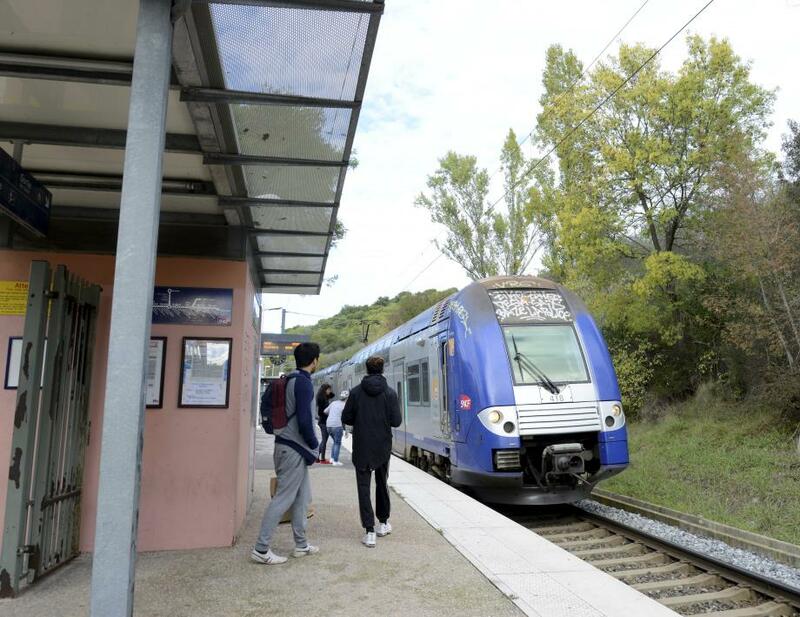 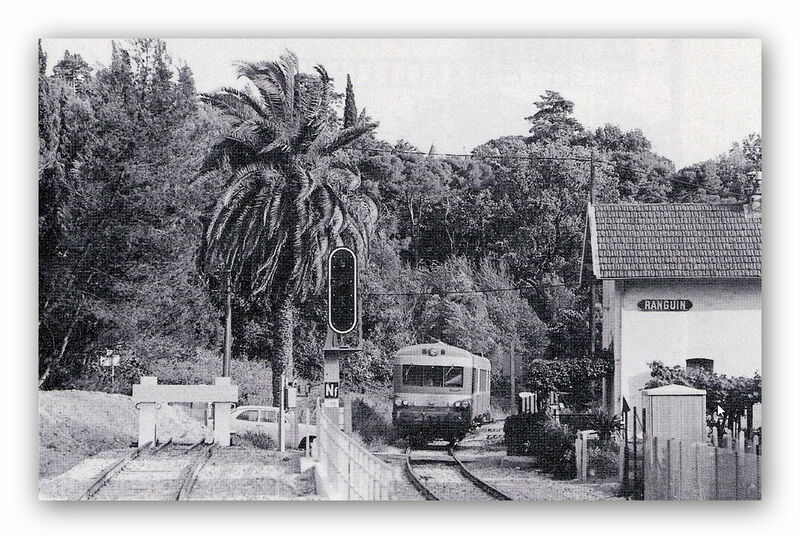 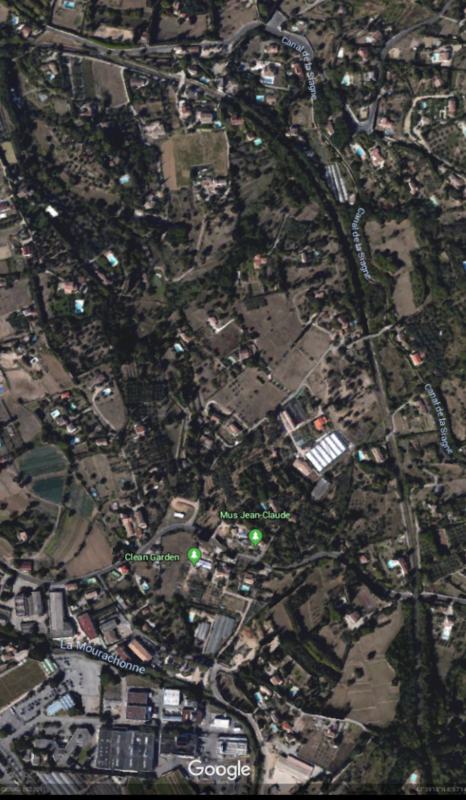 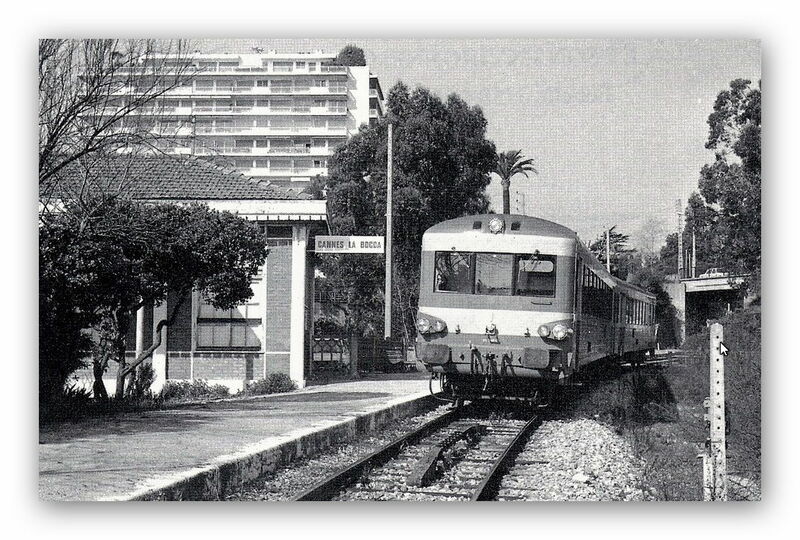 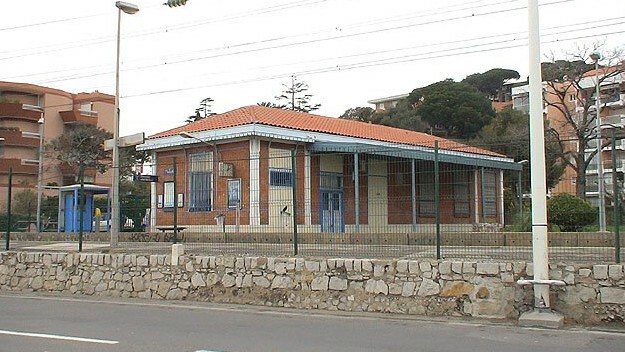 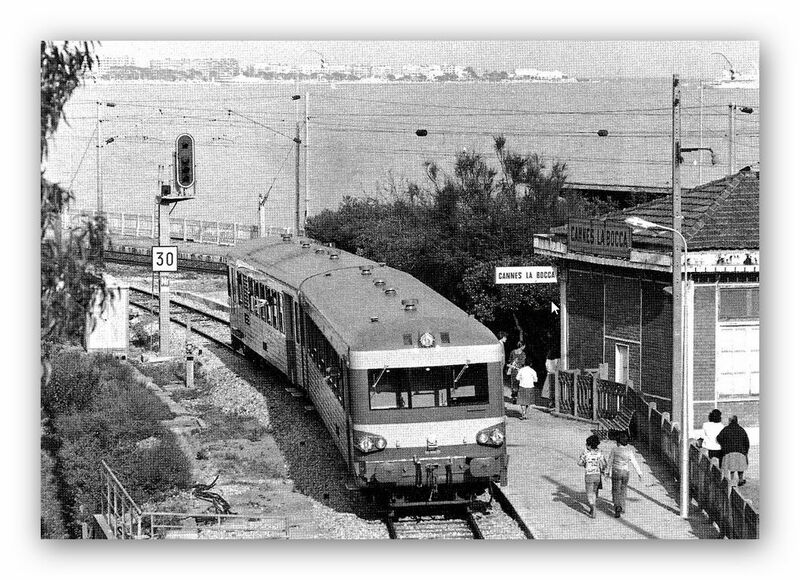 After Mouans-Sartoux, the line continued in a Southerly direction passing through Ranguin, La Frayere, Le Bosquet and Cannes-La-Bocca before running along that main coastal line into Cannes. 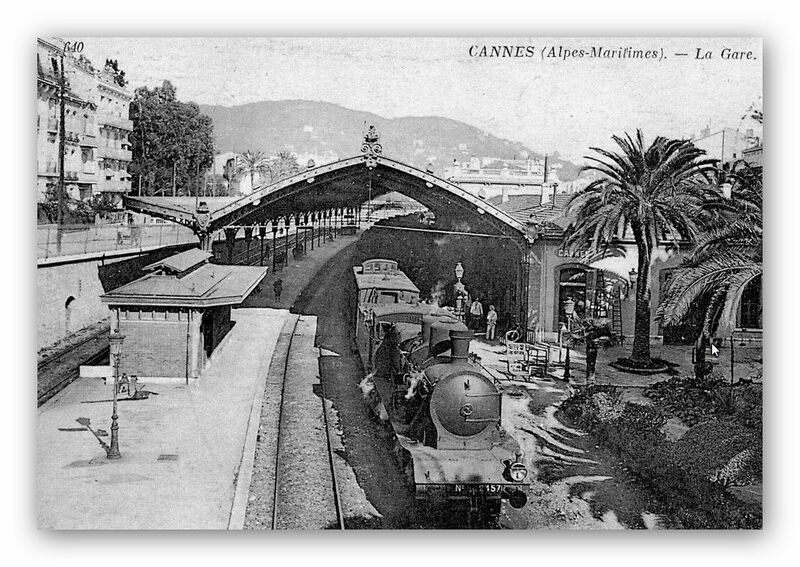 We finish this post with a good number of pictures taken on the line from Grasse to Cannes, and after the last of these some video bonuses! 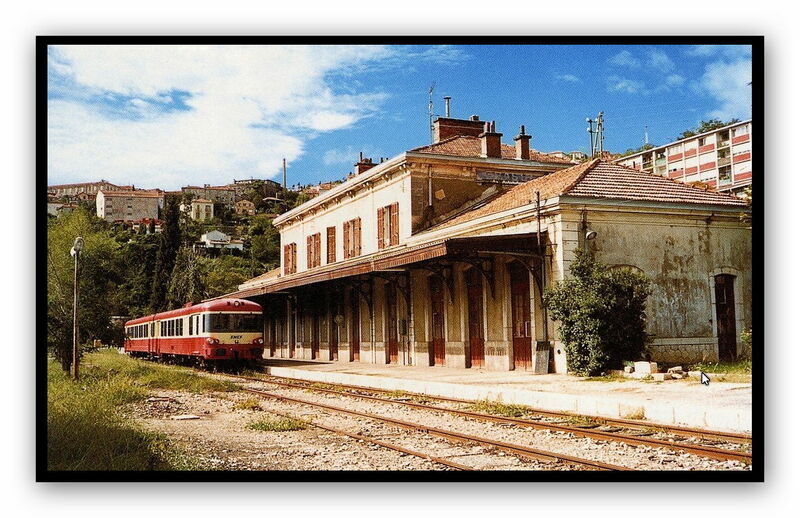 Finally the video bonuses ……. 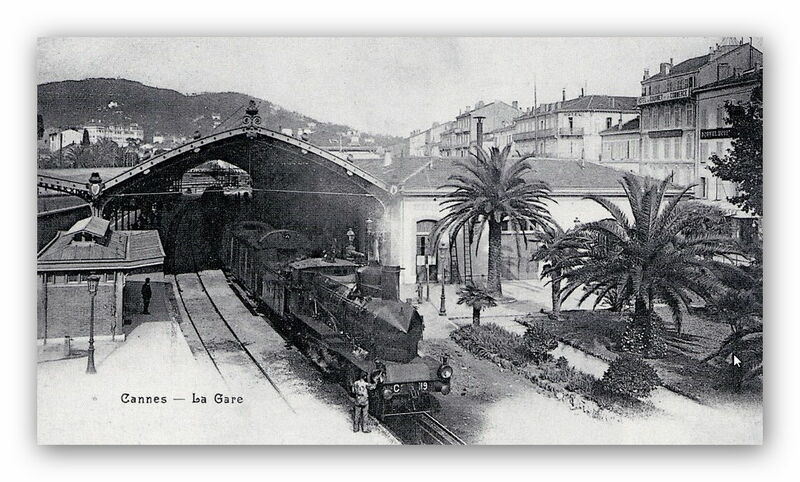 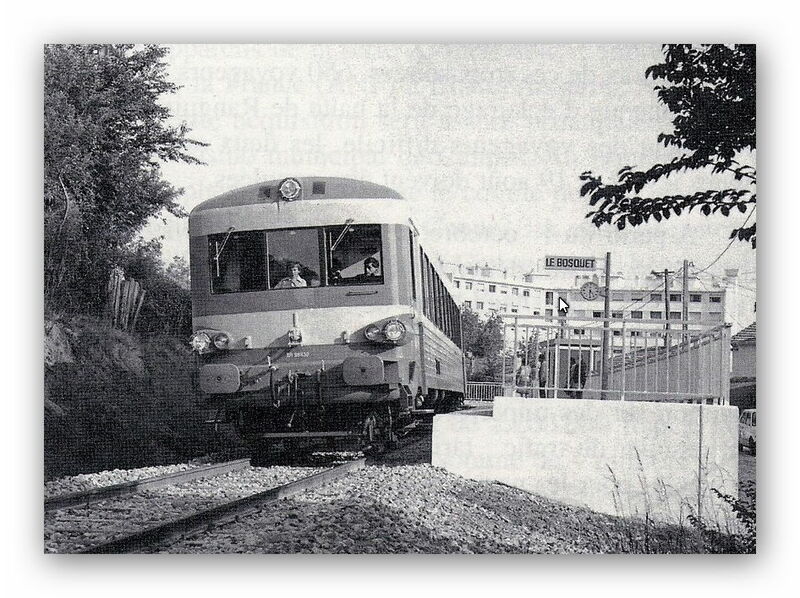 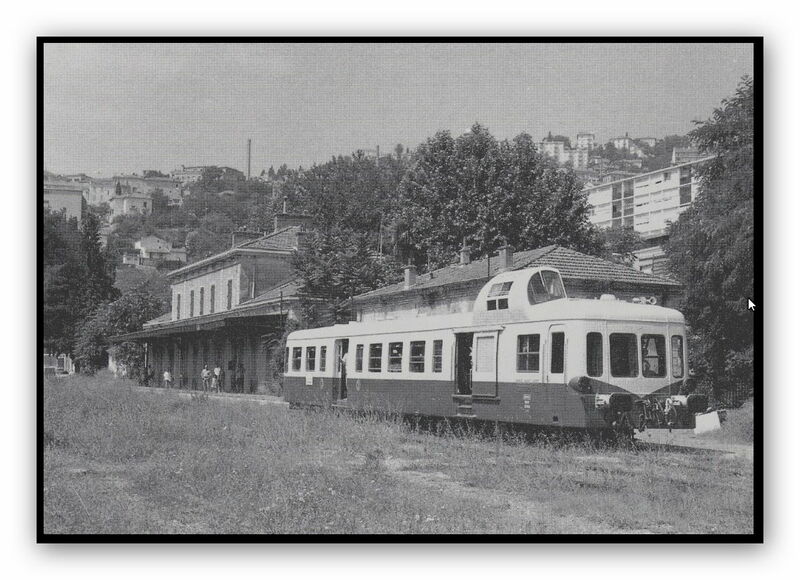 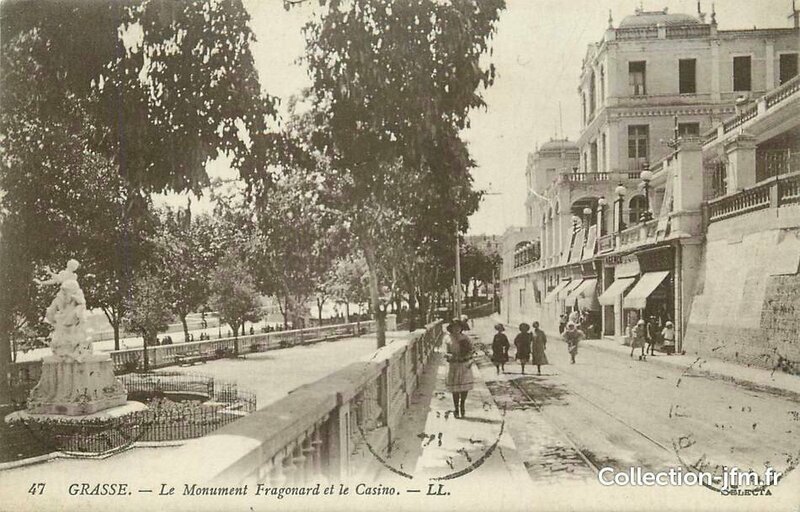 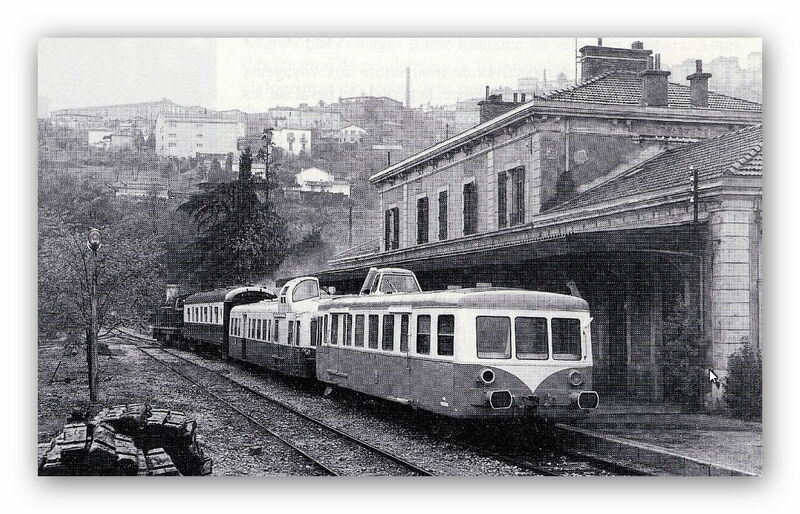 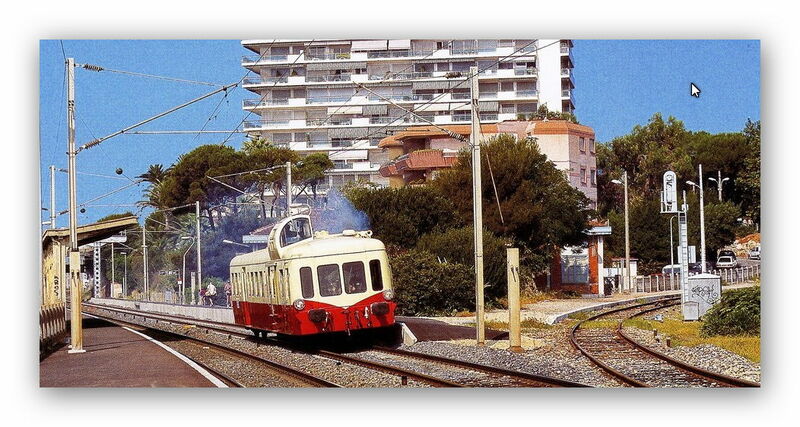 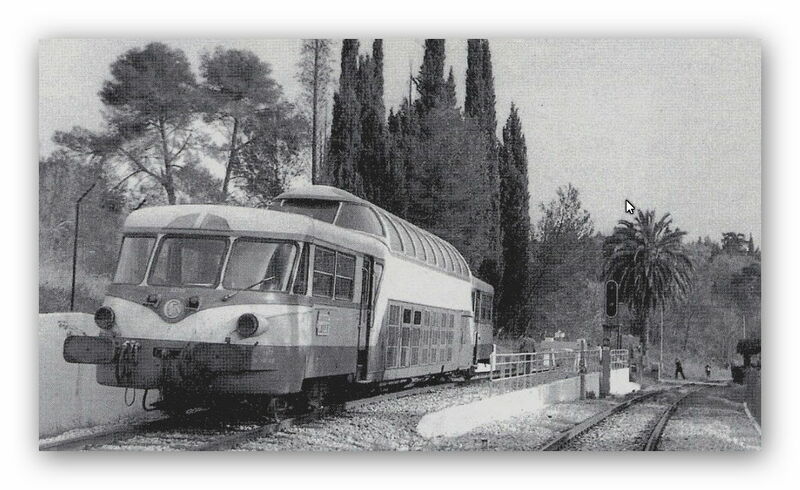 This entry was posted in Railways and Tramways Around Nice, Railways Blog on December 1, 2017 by rogerfarnworth.